Your website is not just a website. It is a conduit to success, a success that is waiting for you out there. On this note, let’s turn the pathos switch off for a little bit: after all, it’s pre-built transportation WordPress themes we’re talking about, not survival of the species. Although those two things are closer than you might think. In 2016, doing business online without a trendy, presentable website is an offense. 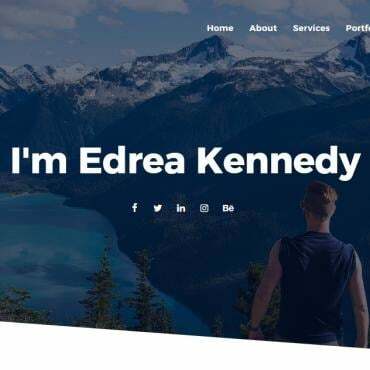 Your clients will seek an experience worth aspiring to when opting in for your service, so starting with a gaudy, old-timer website is a sure way to doom yourself to failure. And if you think that building a modern and fast design is too complicated, too risky or too expensive these days, you’re oh so wrong. Have you heard about pre-made templates? It’s a truly marvelous concept. Instead of pouring tons of money and free time into searching for and paying a freelance designer, you can get a website design you love today, for about a hundred bucks. And there are no cats in bags: with live demos you are able to look at the product in action before you buy. There are a ton of advantages ready-made templates have. They are tailored to a specific look by a team of professional designers, meaning years of experience stand behind each of those themes. 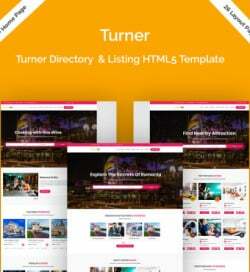 Pre-built templates support latest web technology, such as HTML5 or Parallax. They are responsive and look splendid and consistent on any screen size you can imagine, from a small phone to a 4K TV. There are a ton of them, so you’re sure to find something for yourself. However, maybe the most important thing about them is their SEO adaptation. Let’s talk a bit more about that, shall we? 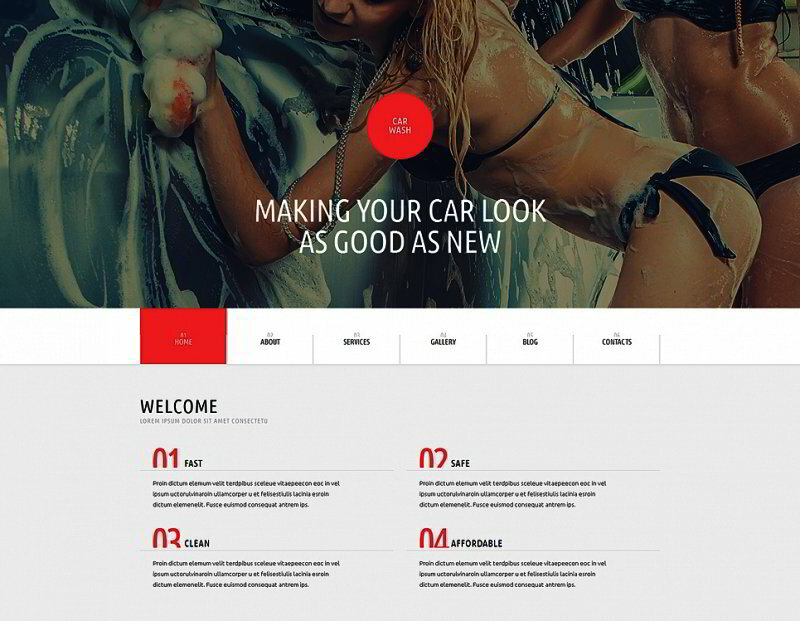 Today, we present you a dozen gorgeous SEO-friendly WP templates on cars, taxi services and general transportation. Pick something out for your business and be on your way to success. 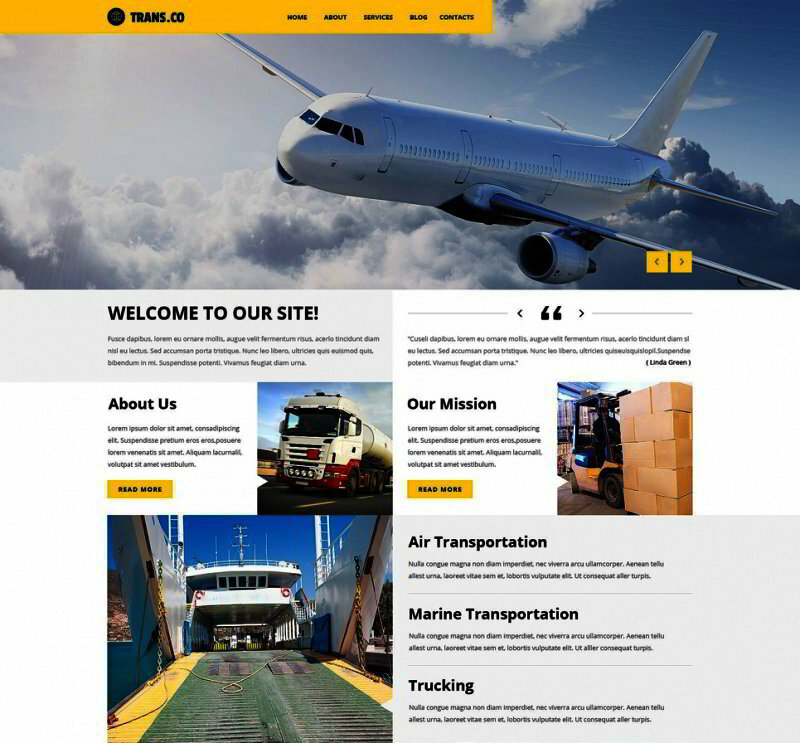 A clean, bright transportation WordPress theme that will instantly convey a message behind your service: not only do you do your work professionally, you have fun while doing it. There’s a lot of room for colors (the example here uses rich red as a backbone color for the website’s pallette) and images, which makes for a visually-memorable website. Pay attention to the level of user-friendliness this layout offers. The main page here is a grid, simple blocks structured nicely with all the necessary information. It’s a very coherent design that a no-nonsense business venture will definitely enjoy. If you’re in business of luxurious transportation, picking a layout that resembles what your approach is all about is a good bet. 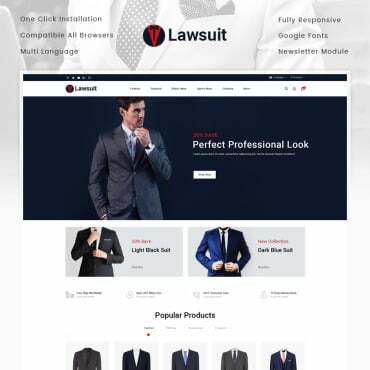 Don’t hesitate and opt in for a breathy, light website design that combines the latest trends in minimalist style with the richness of Material design. 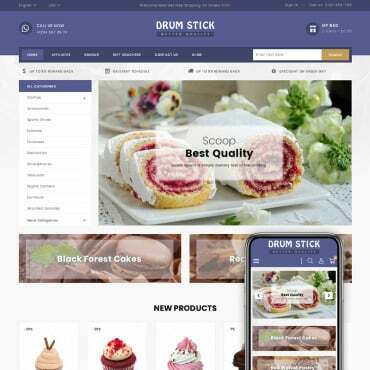 Pay attention to the big header image on top of the main page, it’s an instantly eye-catching element of layout that will make your visitors stay and browse the website. 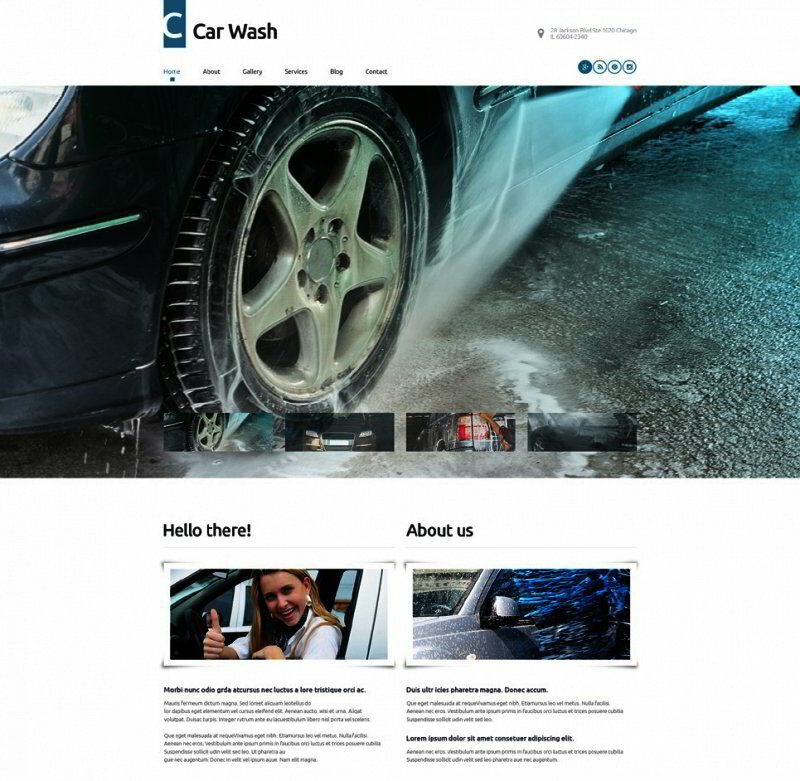 Well-implemented animations will make your website fun to use, take notice, it’s the latest trend. This is the Monstroid theme by TemplateMonster, meaning it’s a web design marvel, as easy to use as it is to customize it to your liking. 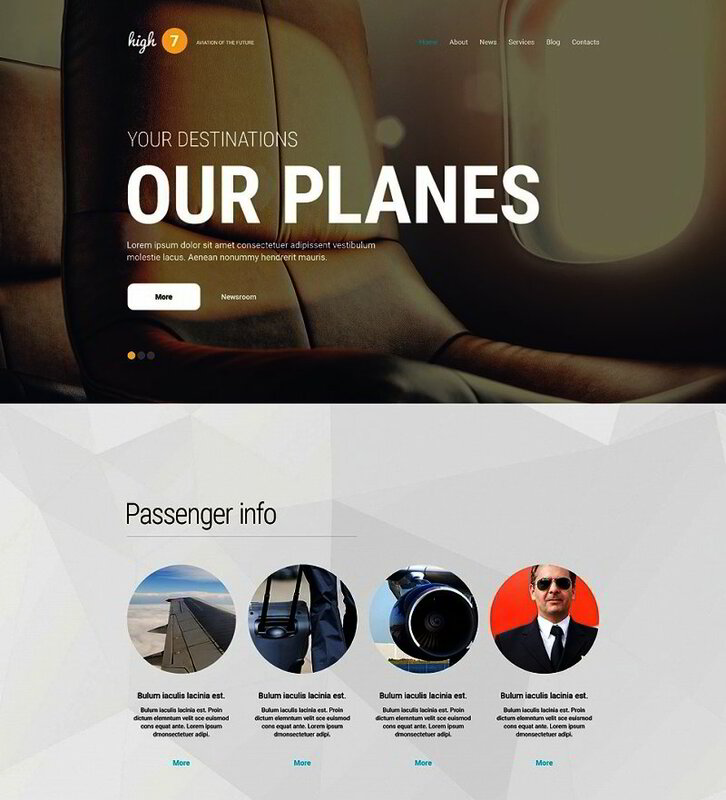 If you’re intent on colonizing the sky, go for this beautiful, serene theme for your website for airport, airlines or general air transportation business. Its color palette masterfully utilises various shades of blue to highlight what it’s all about: the sky, the freedom, the travel. Bold, huge font for the tagline on the image slider right on top of the main page creates the impression of a professional, confident service. Don’t forget to pay attention to menus and buttons: they were specifically designed to make the experience of browsing your website as easy as it can get for the end user. If you consider your taxi service to be upper-class, a luxurious affair for smart people who know their worth, it’s especially important to have a website worth aspiring to. Chances are, people will discover your services through the internet. If you have a regular bleak and boring website, what’s the reason to pay extra and not use one’s own legs? To solve this problem, thinking about relaunching your website with the template at hand. It’s powerful, beautiful and very well-designed. Its structure is a marvel, fluidly changing information sections from one to another and managing to contain all the important information without going over the board. 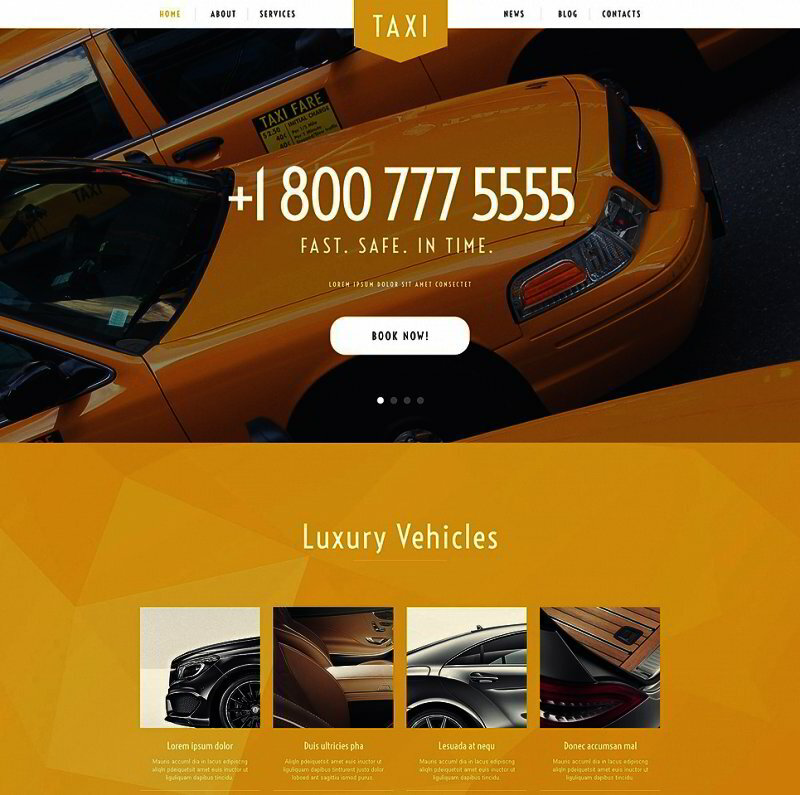 Rich yellow color helps to create a memorable visual character for your website. Sometimes you don’t need to have a lot of information, latest news, and contact, and everything else, to convey what’s happening with your business to your clients. What do you think about going the other way? This pre-built transportation template is a masterclass in modern minimalist design, combining gorgeous visuals with self-restriction when it comes to non-essentials. On the other hand, maybe you’d like putting every important bit of information right there on the main page. 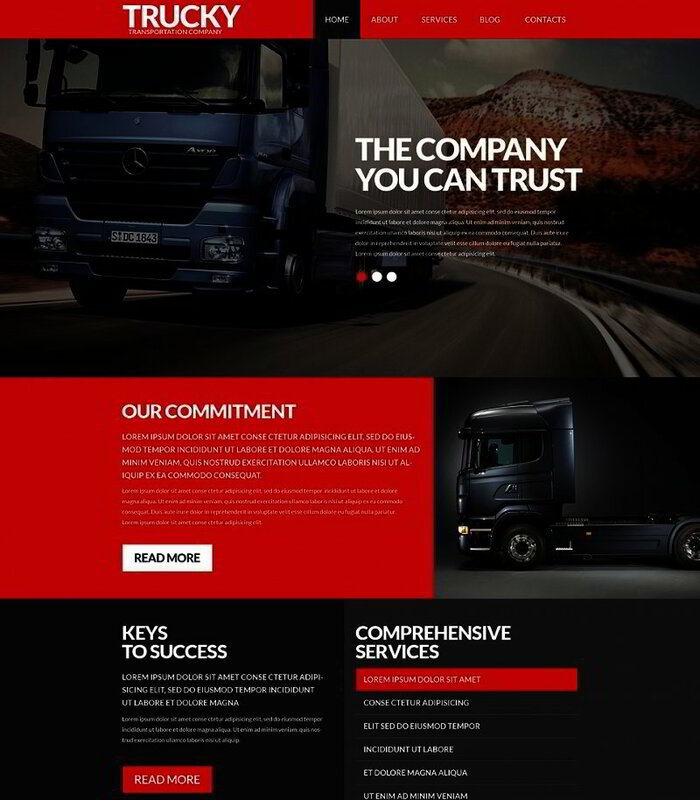 In that case go with the Trans.co template, which is able to contain everything from news to contacts to you mission statement and the about us section in nicely designed, self-contained boxes. They are all aligned to a single grid, meaning they are all well-balanced and lovely to look at. 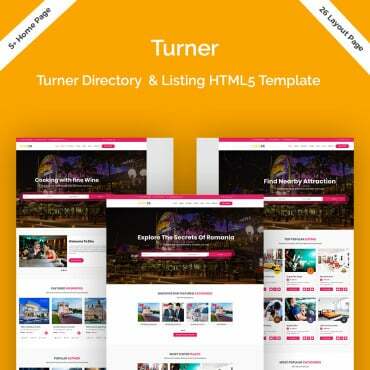 And if you want to sell tickets online, the best eCommerce templates have got you covered. 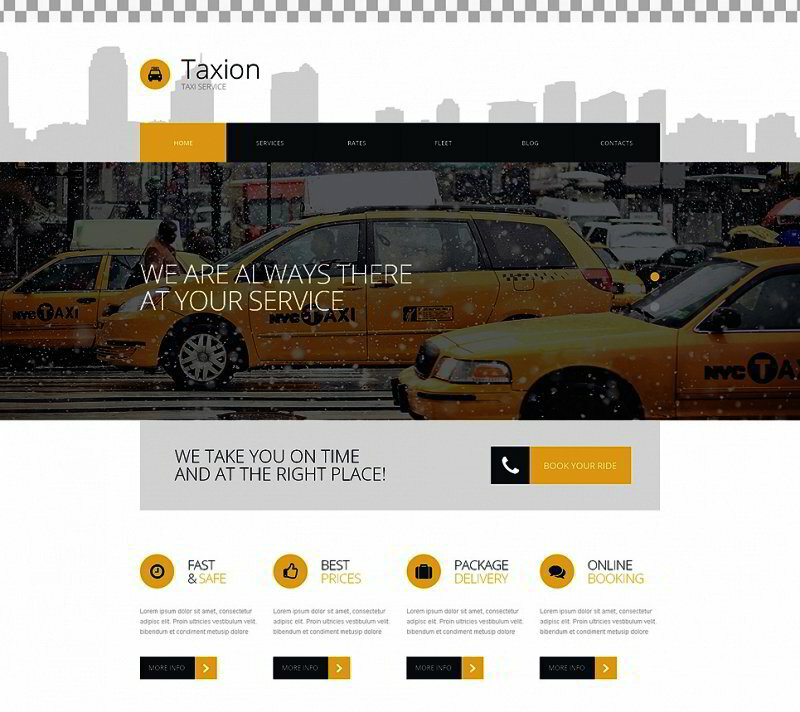 If you are builiding a taxi service of tomorrow, a service that is both affordable and aspirational, maybe you’ll find the Taxion template to be your best choice when it comes to website look. 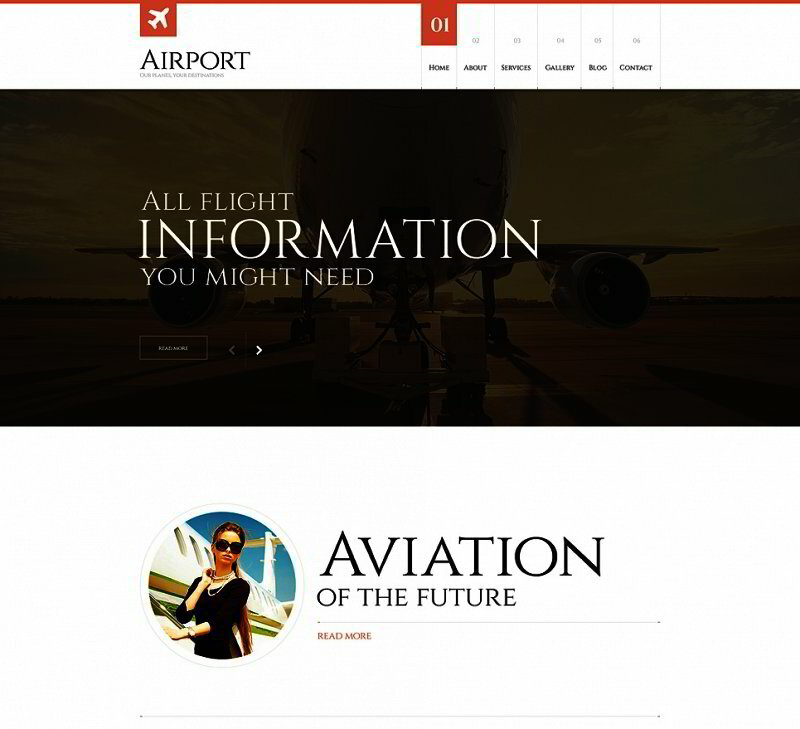 It’s a creative, imaginative layout, with the menu on top of the image slider, after which comes a everything else. The color palette stays consistent in every part of the website. What else? This theme looks glorious on a small screen: its responsive design is truly a marvel. 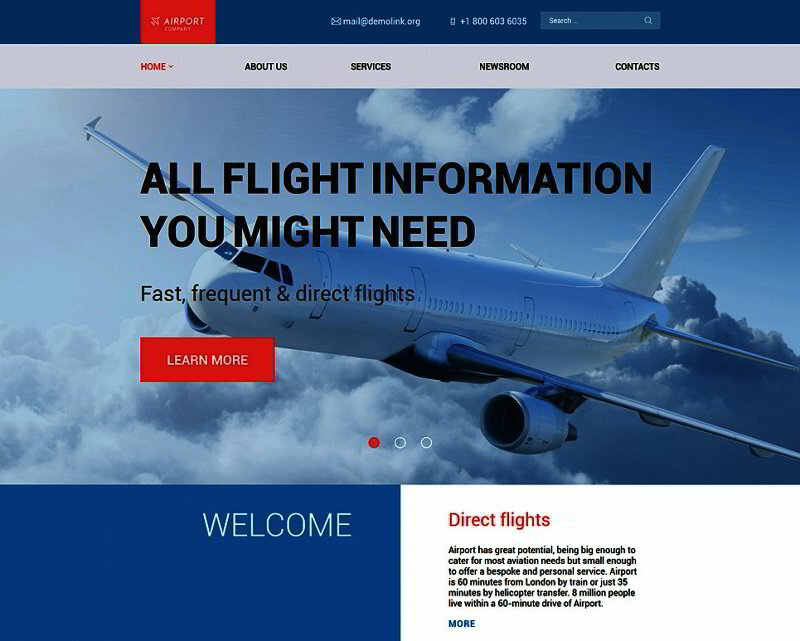 Launching a website for an airline company or anything else connected to flights could be complicated because people expect certain level of professionalism right from the start. With this theme, it’s easy. It is fashionable and trendy, utilising crisp imagery and flawless animations, resulting in a design that is not going out of fashion soon. 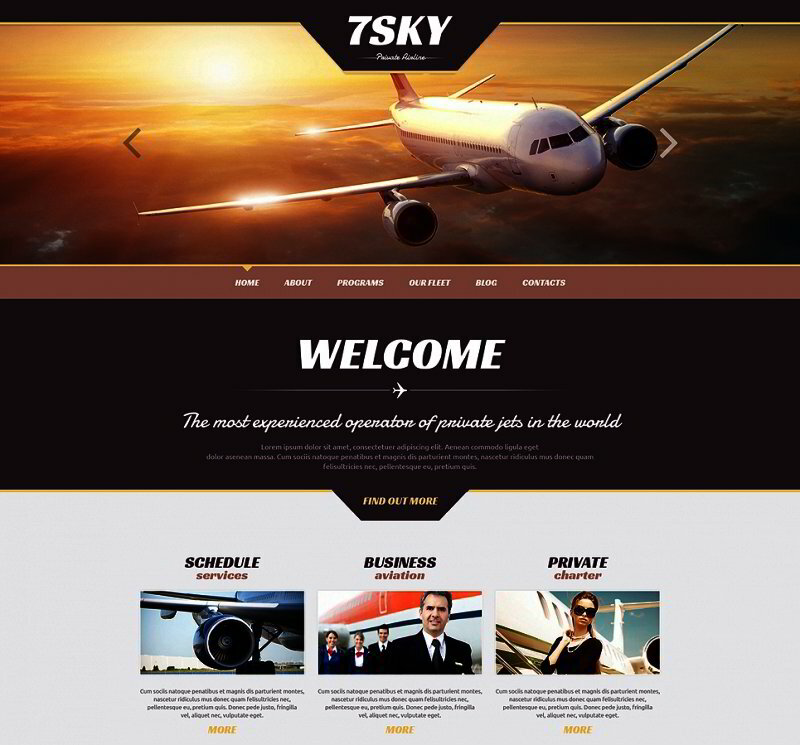 For a more stylized look, consider choosing the 7sky template. It has a lot of advantages, first of them: a smart combination of a retro aesthetic with modern minimalism. The color palette, some of the design touches (like the brush strokes in the menu outline) came right from the glorious day of the commercial flight, the 1950s. 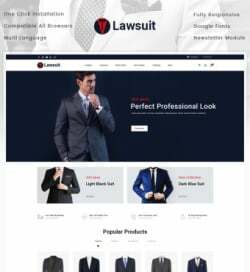 On the other hand, the structure and general layout of the main page, its responsive design and fluid animations are deliciously modern treat. The most notable feature of this auto WordPress theme is its block-like menu in the middle of the page, right between the image slider on top. 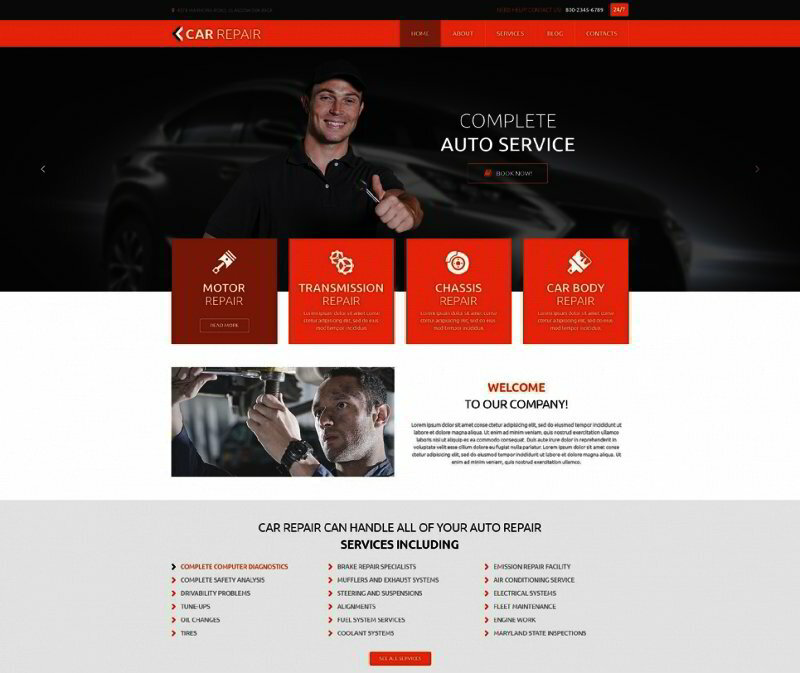 It manages to convey your whole website as a combination of several simple categories. Your clients will never get lost again. 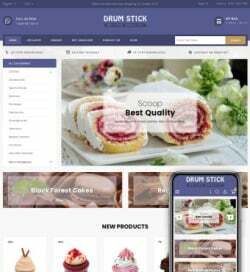 In addition, this theme is beautifully colored and animated, resulting in a very fun, memorable experience for the end user. One of the most creative and modern templates from today’s selection, this theme is a pleasure to look at and a pleasure to use. Its minimalistic style gives way to readable fonts and fluid animations which make your website fun to look at and fun to use. The theme is fully customizable, so you can switch up whatever you want, and it’s responsive, so it’ll look good on any device. 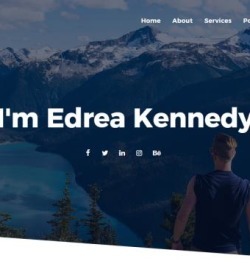 Parallax-powered image slider right on top of the page is the main point of interest of this template, instantly catching viewer’s attention with its crisp photos and well-animated previews. The theme is astonishingly animated throughout, due to HTML plus JS. In addition, the designers behind this template spent a lot of time balancing the usage of colors: the result magically feels “just right”.